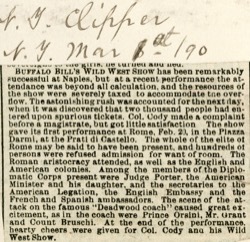 BUFFALO BILL'S WILD WEST SHOW has been remarkably successful at Naples, but at a recent performance the attendance was beyond all calculation, and the resources of the show were severely taxed to accommodate the overflow. The astonishing rush was accounted for the next day, when it was discovered that two thousand people had entered upon spurious tickets. Col. Cody made a complaint before a magistrate, but got little satisfaction. The show gave its first performance at Rome, Feb. 20, in the Piazza Darmi,  at the Prati di Castello. The whole of the elite of Rome may be said to have been present, and hundreds of persons were refused admission for want of room. The Roman aristocracy attended, as well as the English and American colonies. Among the members of the Diplomatic Corps present were Judge Porter, the American Minister and his daughter, and the secretaries to the American Legation, the English Embassy and the French and Spanish ambassadors. The scene of the attack on the famous "Deadwood coach" caused great excitement, as in the coach were Prince Orsini, Mr. Grant and Count Bruschi. 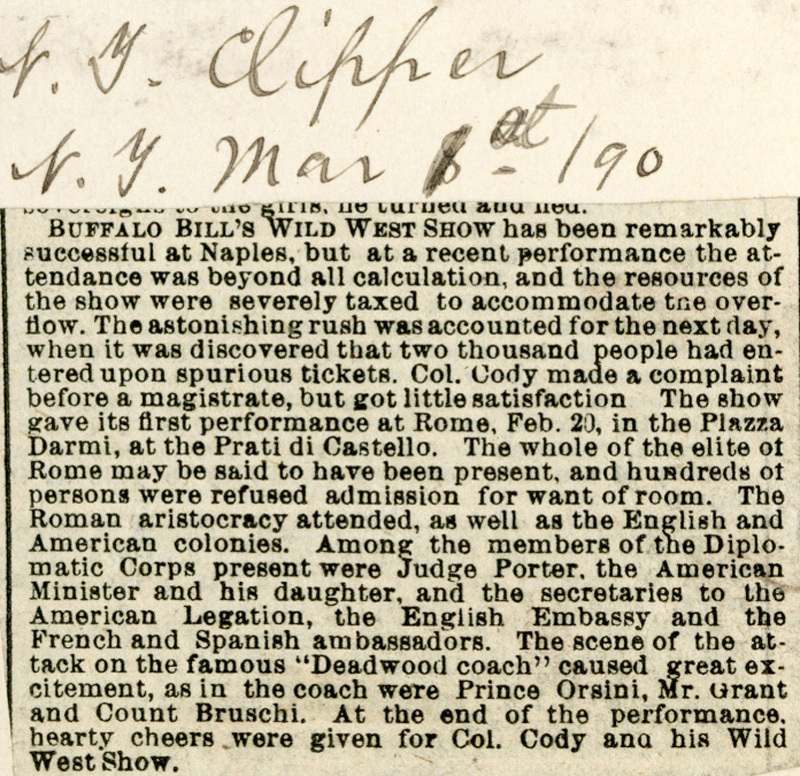 At the end of the performance, hearty cheers were given for Col. Cody and his Wild West Show.